A few weeks ago, I wrote about my purse carrying habits and wondered what purse pattern designers and their testers did with all of those fine bags that they make. Do they use them? If so, what are their favourite designs and why? And if they don't use them, do they sell or give away their handmade creations? Lastly, if they don't use them, what do they use? I reached out to some folks whose work I have seen and admired and asked them if they'd like to share the answers to those questions. Previously, we heard from designer Christine of Chris W Designs and crafter Daryl Perry. Today, I consult with designer Janelle of Emmaline Bags and pattern tester Krista. Janelle says that whenever she comes up with a new creation, she tests it out in actual use. 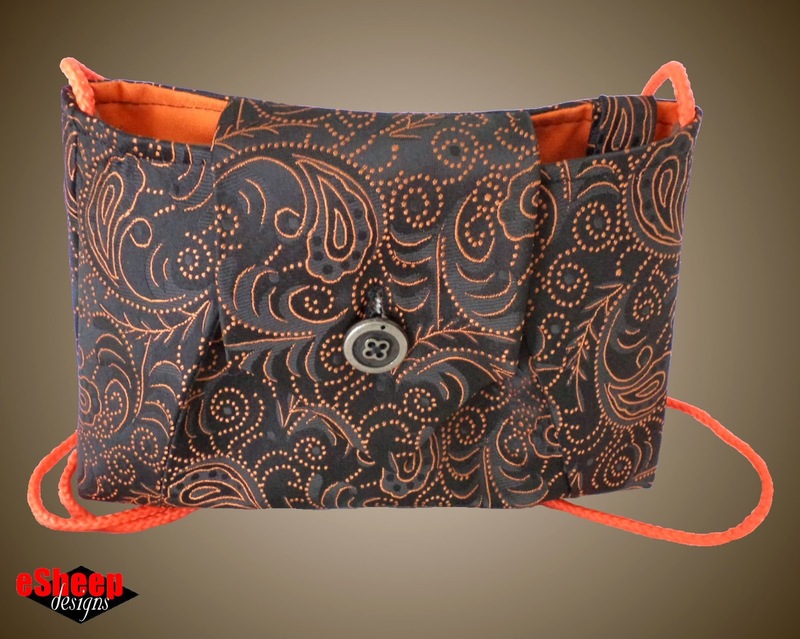 "I always try out my bags and wallets that have been created for an up and coming pattern for at least a week or two, and if I really like it, for several months. I tend to create patterns for designs that I like and want for myself anyway, and I also need to carry it for awhile to see if it needs any tweaks or adjustments to make it just perfect. Sometimes items look wonderful on paper, but when used in real life, you see things that need to be altered." So what's on her arm (or shoulder) now? It's a secret, apparently. "I am currently carrying a bag for my upcoming book, co-authored with Lindsay Conner, and I am in love with it. Sadly I can’t share it yet!" She adds, "I haven’t purchased a store bought purse in years, but when I did, it was because I desired a leather bag. Not a particular brand, but just a nice soft leather bag. I love bags, that’s why I’m here, and sometimes a leather treat is necessary!" What does Janelle do with her sample test bags? "After I am pleased with the pattern design, I always make a few samples in different fabrics. I can’t carry all of these so I give them to close friends and family members. I always keep a sample to show at quilt shops, and if I do have an extra, I hope to be able to offer it to a charity raffle that may pop up. Last year, my son’s teacher was happy to receive a “Totes ma Tote” bag for her end of year present. I haven’t sold a bag in years." Perhaps the most eye-opening discovery that I have made over the past couple of years of making my own bags is that they are notoriously difficult to get rid of... unless you do just that: give them away. But as Krista (who posts as MrsSM) and others have said, it's sort of tricky to give away bags, because they really have to appeal to the recipients in order to be used. Krista is a great example of someone who handcrafts bags and purses because she loves doing so (and does it so well as evidenced by her work, a sample of which is shown at left), but she has not yet figured out how not to become buried in her growing collection of said bags and purses! I had a "conversation" with her about selling one's own work and she agrees that it's a difficult process. "I've sewed a couple of things for gifts and made something to order — but the majority of my projects sit wrapped up and protected in my basement. They are good enough to sell, and I hope to sell them. I just have to figure out how because after all, I do have a busy life to live. I'm not sure craft shows are the best way to go, but I guess I need to try it at least once or twice to be able to see. I've got an Etsy store under construction..."
And of course, the biggest barrier to selling our projects is price. What is that golden price at which a transaction will miraculously take place with both parties being happy? (Actually I've often heard that the ideal price point is one in which both parties are equally unhappy.) Oddly enough, this same topic came up across the ocean when my tester Nekane blogged about making her first sale: a MyTie bag, of all things! We live in a world where we can sit in our pajamas and shop around the globe, buying things for next to nothing. While many people may admire our handiwork, not many are willing to pay for the actual "blood sweat and tears" that goes into our crafting... or, even the bare bones cost of materials. Krista says, "I started a Facebook page for my sewing projects with the hope of getting some exposure and perhaps some custom orders. The first project I posted about, I had several inquiries, which was very exciting; when I gave the price, though, the interest cooled off pretty quickly." I've occasionally thought that we should have a marketplace dedicated to "one off" handmade bag and purse creations, where individuals can post their individual projects and either present a price or do that eBay thing of "make me an offer". I suppose it would be kind of like a Kijiji, but not so crazy (have any of you found Kijiji to be increasingly insane?) and not specifically local. A lot of us would have an interest in selling one or two items at a time, rather than trying to accumulate enough product to open up an online store in which we have to fork over a percentage to whoever is hosting it. Krista thought it was a great idea worth pursuing... all I need is some help to make it work. Is anyone listening?? I think one of the problems with selling your creations, whether it be a handbag, a quilt, a painting, etc. the handmade market is totally saturated these days more than ever before. 20-30 years ago you could do craft shows and sell things, but now with so many crafts shows, Etsy, and similar online handmade places you can sell, blogs, and well the internet in general makes the competition super tough because we can sit at home a search for what we want to buy. It's also like finding a needle in a haystack to find something you want to buy or to be found to sell what you make. Some things are really works of art and well done and others are just making crafts after they took a class or watched a YouTube video and they get out there and start selling too. So you have all kinds of "quality" and those who do not make handmade items don't know and can't tell the difference. It's hard to see the quality in a photo sometimes too. That also hurts the ones who make quality items, because using quality "ingredients" and ending up with a quality handmade item is different than someone who slaps together something quickly. Everyone thinks they can sell and often I am told I should sell my things when people see what I create, but it is so much easier said than done. Because who is buying? And price is a huge factor as to whether something will sell or not. People want a bargain. You don't always have the option of being able to talk to the buyer if you have things at a consignment shop. In fact just the other day I got a call from the shop I have a few things for sale because I had knit a doll dress and was selling it super cheap. I wanted to get rid of it and wasn't planning on making anymore knit doll clothes. I knit this as a tester for a knit pattern designer. It took me 3 days to knit it and I knit several hours each day. So I get a call that the woman who bought this dress wanted to know if I had anymore. Of course she wanted to buy more because it was so cheap she couldn't even buy a skein of yarn for the price I was asking. I have things I have made that I want to get my cost to make it back but I know there is no way I will ever make a dime on my labor. It has to be a labor of love because it's the very rare person who can make things to sell and make a real profit. In order to be found and get sales you need to spend every waking hour on self promotion and then you have no time to create. So then if you end up hiring people to do the promotion or the making of the creations then your prices would rise higher and your quality might go down and now it's a real job and not just a creative outlet for joy in your life. Now you are stressed. So if I cannot sell what I make to get my material costs back, then I will donate those things. People will bid on items at an auction for a good cause and pay what they are worth and more, yet they won't buy directly from the artist/crafter for even less money than at an auction. I guess they can justify it by feeling better that the money went to a good cause, yet the money spent by the crafter who donated the item doesn't earn anything and it cost them money to create the item. I am all for donating to good causes, but you cannot buy more materials when you don't have money coming in and all your creations are given away. This could have made an excellent "guest blog post", Daryl. Many thanks for taking the time to share your thoughts. You've touched on a couple of key points that I want to address further, so I expect this discussion will be continued in a future blog post (outside of the "What Purse Do You Carry" realm). Thanks for the feature. I loved reading your post and Daryl's comments too! I like the idea you have forming there… about the "one-off-shop". Work with it! As I stated in your part one....I agree with Daryl. First, I'm not a good marketer, so honestly, I haven't even tried to market my goods. I love to sew bags and I usually sew the same pattern four at a time. I donate all of them to local charities, one of each design so as to not saturate the auction bidders. Often times, there is 40-50 dollars in materials in a bag when you account for interfacing, thread, fabric, leather, hardware and the cost of the electricity for all that darn ironing! I personally would NEVER pay that much for abag and wouldn't expect anyone else to pay that price either. I have had folks ask me to custom make them something, to which I reply "I do not sell my items, but I would be glad to make you exactly what you,want, donate it to (insert name of charity here) for their next online or live silent auction and you can bid on it there, with all of your bid price going to,charity, not me". I actually had one woman have THE GALL to tell me she would happily pay $20 to me for that leather bag...I just thought to myself, I'd rather toss it in a dumpster than devalue myself (and other crafters) in that manner! And I would! It is funny to me how no one will argu or negotiate with a plumber or electrician at $40-$60/hr, but folks think those that sew should work for nothing...but, until places like Walmart and Dollar general start farming out those skilled technician jobs like they have made goods, this cycle will always persist. Just my two cents worth. I always enjoy reading posts on this topic. I find our experiences and perspectives are very unique to each of us. I do sell my bags, and I do make money doing so. While my business is not in the black - it's due to my buying in bulk and creating a stick of materials. (That and I love fabric!) I do have a very cut and clear method for determining my pricing and I stick to it. I have done a couple of shows, one continued to give me business for 4 months after. I have several repeat customers and many referrals I work on. I carry any new pattern prior to selling it, the best part is I can show its wear. I made a NCW from Emmaline about a year ago and have carried it daily - the scotch guard has worn off...so it's a bit dirty...but it's otherwise in perfect condition. It's a real joy to show it and explain how it still looks good a year later. I do donate, gift, sell and carry my own bags. I do have lots of bags to chose form but most definitely have favorites. I carry one for youth group, one for work, one for shopping...I don't have a shortage that is for sure. I even have started sewing with leather so I can make my own leather bags too. I have a very high standard for the work that I will sell, and am quick to judge my own work harshly and keep it or gift it vs expecting money if it doesn't meet my standards. I don't sell dozens of bags a month - but I also pride myself in creating one of a kind and won't create duplicates on any of my handbags. I do agree the process is tough, I am working on marketing, learning to blog, posting on fb so I keep followers...it's amazing how much time I spend trying to keep my name in the light - and I am sure I could do more and be more successful. In the mean time, I keep putting my name out there, going to shows, and spreading my love through my stitches. I would like to be busier, and pray with time, continued work in the studio and on the web this dream will come true. For every ten who don't appreciate my handmade work there is one who does - and that is who I want to touch.